When I began my novel writing adventure my instinct was to sit down in front of my MacBook and begin typing in Microsoft Word. But when I thought about all of the other documents that support a writing project of this magnitude, I realized that a standard word processing application may not be the best choice. How could I easily find, clip, and access all of the notes, websites, images, and other pieces of content inside my writing project easily and without losing stuff? After doing some research on professional writing tools, I decided to try an application called Scrivener, from a small software company named Literature & Latte. Based in the UK, the company (and the application) is the creation of Keith Blount, a fellow writer who needed a better way to write and organize long writing projects but could not find one that suited his needs. So, as is often the case, brilliance was borne of necessity. Scrivener is one of those rare software gems that fills a need so perfectly that you cannot imagine how you lived without it once it becomes part of your workflow. I have only encountered and few such applications in my 25+ years of computing. And this one is a beauty. Scrivener has versions for both Mac OS X and Windows and it is very reasonably priced — less than $50. It is simply awesome. Really and truly. The only shortcoming for me was that Scrivener is not available for iOS so it cannot be used on the iPad. But, with a little more research and some helpful suggestions from the folks at Literature & Latte, I was able to solve that problem too. First, I made sure that everything associated with my writing project, especially the Scrivener files and backups, are stored in my Dropbox folder. Dropbox is a cloud storage solution that keeps your stuff safe and secure by automatically mirroring everything you put in the Dropbox folder on your Mac or PC to cloud. Easy peasy, lemon squeezy. You get 2GB of storage for free, but you can earn more for referring friends, or pay for big chunks of storage at very reasonable prices. With all of my files stored in my Dropbox, I can access them from anywhere via almost any device. I can open my Dropbox files from my work laptop (Windows 7), my personal laptop (Mac OS X), my iPhone, or my iPad. Best of all, if I have the native application on the device in question (or a compatible application) the files are fully editable. Now I know a lot of ink has been spilled writing about the pros and cons of writing on tablets (I use the term tablet to acknowledge that, for the moment, there are lots of tablet choices in the market — but I really mean iPad). The idea of creating or editing content on a tablet is a favorite topic of debate among the bloggers and technology pundits, but for me, it comes down to individual preference. Personally, I have no trouble writing or editing content on my iPad 2. The on-screen keyboard works well for me and carrying the iPad wherever I go is much more convenient than taking along my MacBook. The key to enabling my writing on the iPad is an app named SimpleNote. This free app ($20 for the premium version which includes Dropbox sync) currently only works on iOS devices but an Android version in the works. It is a simple note creation/editing app, hence the name. It automatically makes a backup of the previous 10 versions of each note so you can go back in time and see earlier edits to your notes. The real magic is the integration that the folks at Literature & Latte have built into Scrivener for syncing your project documents with SimpleNote. This takes each of your individual documents in Scrivener and creates an identical note in SimpleNote that you can view and edit. 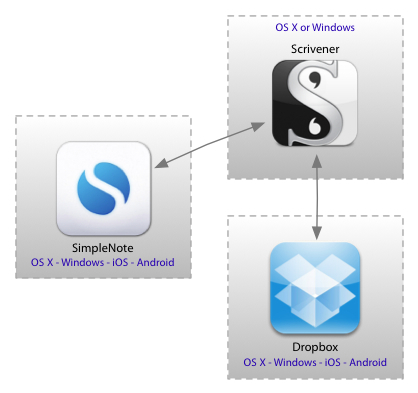 Any changes you make in SimpleNote are incorporated back into the original Scrivener project the next time you sync. It could be a daunting process, but Keith and his team have made it an elegant and simple matter of three clicks. Every time I end a writing session in Scrivener I make sure I synchronize the Scrivener project with SimpleNote so that if I find myself sitting at a Starbuck’s or waiting in an airport, I can pickup my iPad and continue working on my writing project. Anywhere, anytime. I would encourage anyone who creates long, complex documents, to take a look at Scrivener. It is so much more than a word processor and will bring your writing world into harmony. And if you have a tablet, try this workflow and see if it makes you like your tablet more.